As this is our first Vacation Day and in keeping to tradition, we have 2 preludes to the standard Day's flight. With this scenery and the rest that follow for this Vacation Day, your sim might offer up an error message that the "Scenery May Not Look Correct". I was not inclined to troubleshoot other developers packages, so I did test them and all is okay so just go ahead and okay the box when it pops up. Okay, now that you have perhaps 'scratched the tube itch' , now let's get on with Day One. We have been given tickets at Jo'Burg (or have flown in) to get to Gaborone, Botswana ( FBSK ). Once there, we are greeted by Freda, on loan to EPOCH as Vacation Coordinator, who directs us outside and points down the ramp to... what? A line of Douglas DC-3s! Oh Yes! It seems that we have been asked to volunteer to bring these babies from Gaborone up to Maun ( FBMN ) as another part of their journey to the Congo for further service. Although we will be staying in Maun, I'm sure we'll all gladly pass on an Air Botswana trip to Maun and instead fly one of these iconic old birds up there ourselves! 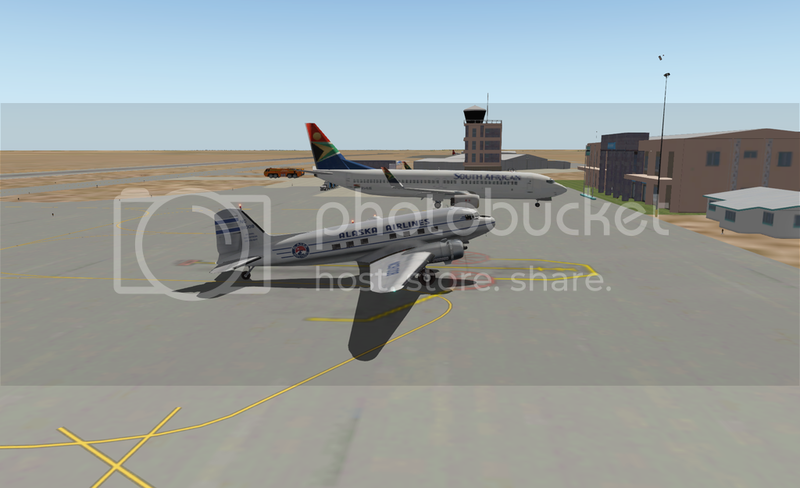 Three Dakotas are now safely in Maun, Botswana. Rocky, gofigure and myself flew the Day 1 from Gaborone while checking for all of the adventure beta things like flight viability, fuel burn, scenery both ends etc. and are happy to report that Day 1 is ready for everyone to fly! A shout out also to CptTroll who had some issues with X-P that prevented him joining us (hope we can get that sorted tomorrow) and Magger01 who dropped by to say howdy and is looking forward to joining the NFers next time! Cheers all. A great flight and way, way different than even tundra flying in Western AK. Think you'll enjoy it! Welcome to Botswana. Botttt-swwwwwaaaannnnna. I like saying it. Here a tail-cam shot of the scenery. Not too exciting, but perfect for my being too-long-out-of-the-saddle return to flight. Lots of pleasant conversion to make the time pass by, and learn a few more things about flying and flight simulators. 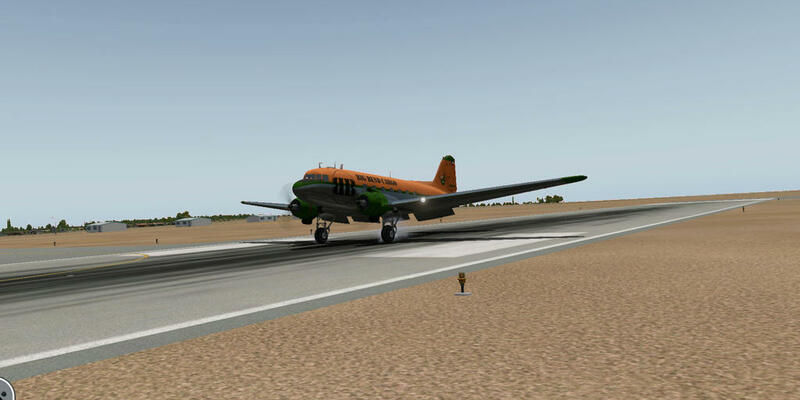 Without any coordination, all three DC-3's left with 4 hours of fuel on board. We experienced near-perfect conditions for the landing at FBMN Maun (I had 2.6 hours of fuel remaining). I'm looking forward to future vacation opportunities from this locale. Tough luck having to fly one of these classic Heinz models to Maun, only to have it taken over by another pilot for continuation elsewhere, The fun and classic luxury of these babies would be well suited to the high-dollar adventurers into the delta. But, oh well, I just savored the experience for the two hour flight. You don't get to see much more starkly beautiful landscape anywhere on earth! 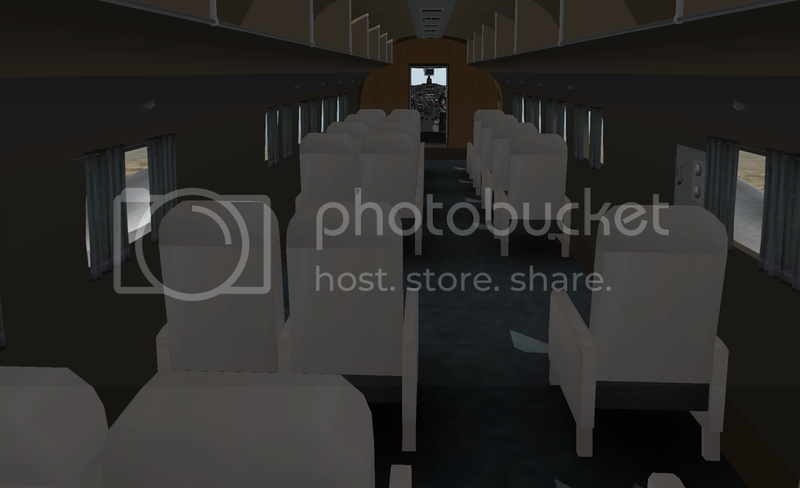 Classic pax environment for sightseeing. Lots of revenue here! Finally some GREEN as we approach the delta region! I dare say this was a lot more fun than flying in on that tube over there! Now to find the Vacation Coordinator, Freda, to get me a golf cart ride out to my Five Diamond accomodations. Parachutes are like guns. If you don't have one when you need one, you'll probably never need one again. Nice pics gents. Thank you both very much! Made it safely to FBMN day one. Look forward to the rest of the journey. 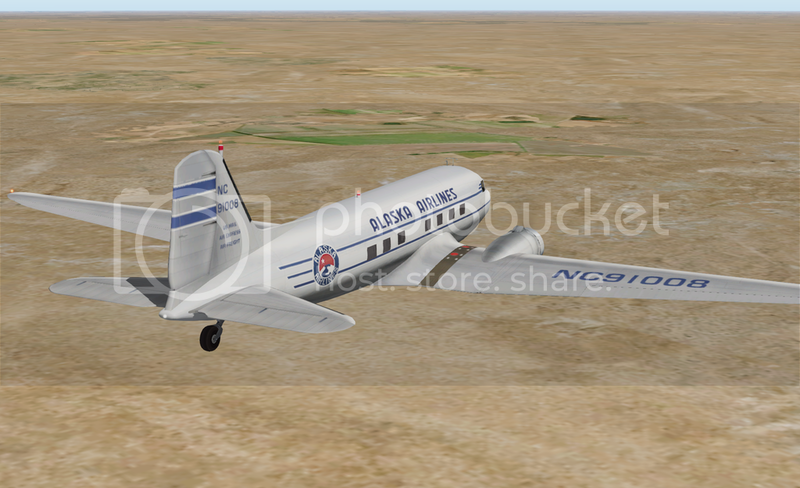 A fourth DC-3 arrived at Maun yesterday. Cpt. Troll brought in a LES bird after an uneventful flight from FBSK. The weather was clear skies with a very gusty 17 knot tail wind. The ride was a little like trying to walk across a trampoline. 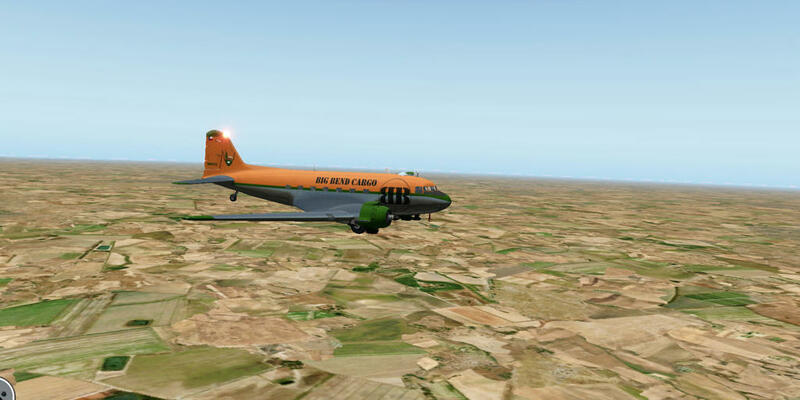 The LES DC-3 behaved quite well and for the first time I used the auto pilot during the last half of the flight. That took a lot of fiddling to keep her trimmed out and on course. The landing was text book, one of my better efforts however, I would do well to remember not to pull back too far on the throttles, it's rather embarrassing to have made a perfect landing, only to have the engines shut down before you clear the runway. Have I mentioned how much I enjoy flying these old radials? As Rocky mentioned earlier, the landscape is quite featureless so I'm thinking navigation in the delta will be quite the challenge, especially for a plane like the SMS DHC-2 which has no GPS. 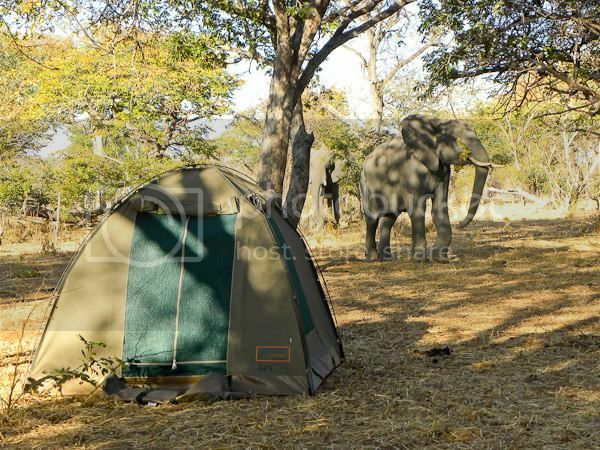 So here we are, on vacation in Botswana, WOW! I'm not sure about the heat, but am really looking forward to hanging out with a bunch of Bush Pilots and our upcoming adventures. Now pass me another cold one mate! "What is a red lake, if it ain't red? Hard to believe that there are ADF & VOR/DME in Africa. I used radials to fly from FAOR O R Tambo Johannesburg to FBSK Gaborone and on to FBMN Maun and ADF as a check once closer to the destinations. So at times you can use Nav1 VOR/DME & ADF to aid navigation while flying the Beaver. 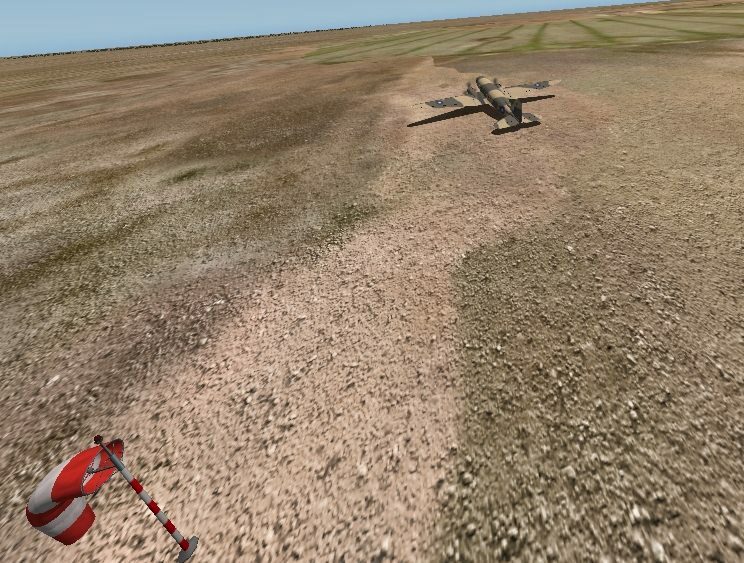 Also someone on Pete"s site was talking about adding a GPS using Plane Maker. 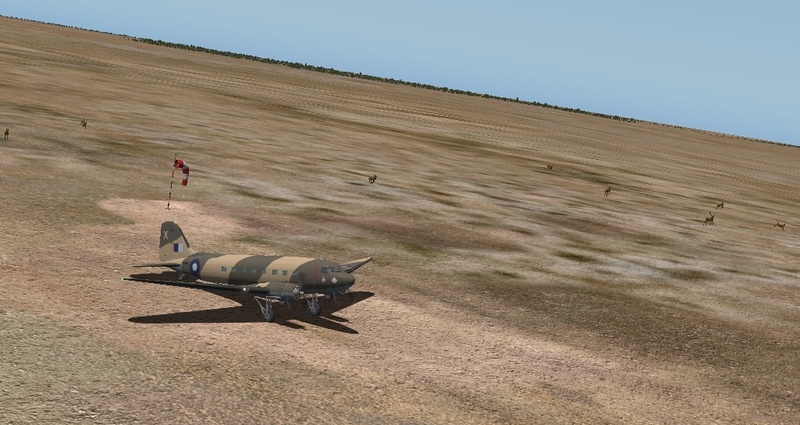 The real joy of flying bush out here is using the ADF out of Maun and a bit of good ol' fashioned navigating, along with the Mark 1 eyeballs of course. You will be surprised to see how difficult it can be to pick your strip out of the near-featureless terrain. Always look for landmarks, few as they may be. I'd be very interested to know how to add a GPS to the SMS Beaver. I looked at doing that a while back but couldn't figure out how to do it. 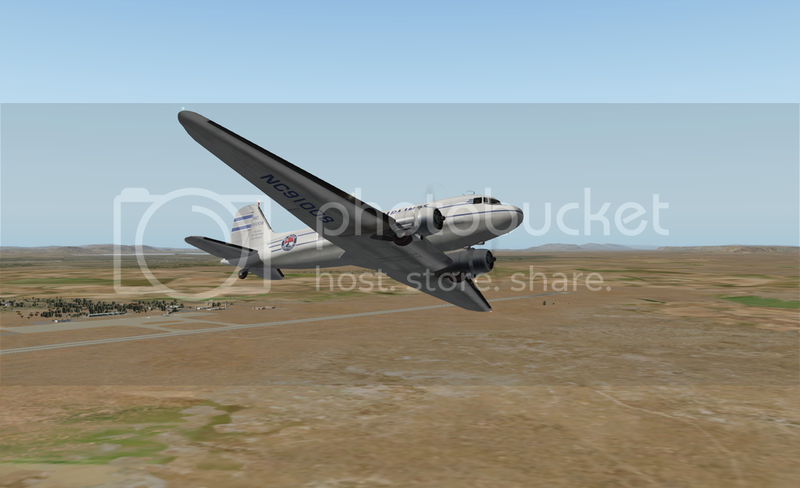 Posts: 1354 I just flew from FBSK to FBMN in the SkyLabs DC3. Great trip! It took me 2 hours +2 minutes at 8500'. I established a wind correction off the outbound VOR radial, and flew that HDG until picking up the destination VOR. I was off by about 2 degrees when 260nm down range. FUN! Love the DC3! Thanks bc. "Keep the Dirty Side Down"
Just thought I'd share a couple of screencaps of my Day 1 flight. I too love the DC3! The brilliant livery you see is the work of Mr. RockLobster. 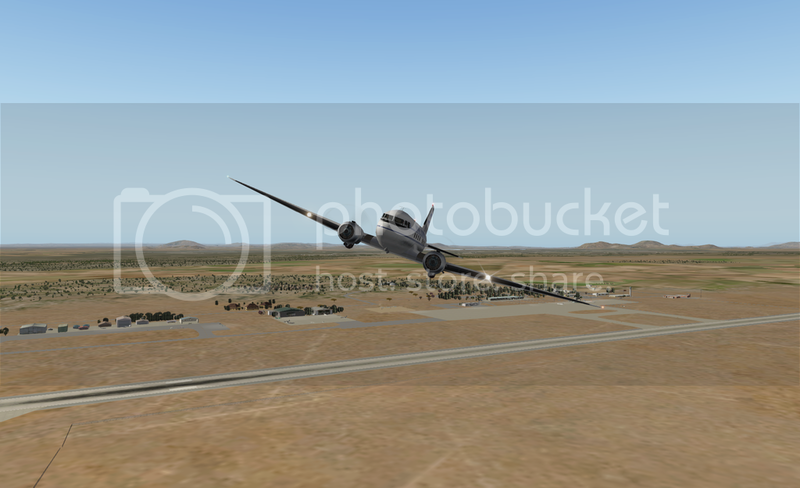 And at the moment, I'm trying to get comfortable with several Cessnas that I've never flown before. After watching all the Bush Pilot episodes bc linked for us, I have a lot of work to do. Those Afric Bush Pilots were very impressive. Good going sir, and welcome to the 'dusty little town' of Maun. You can grab one of the luxury tents when you install the scenery this weekend! bc quote: "You will be surprised to see how difficult it can be to pick your strip out of the near-featureless terrain. Always look for landmarks, few as they may be". 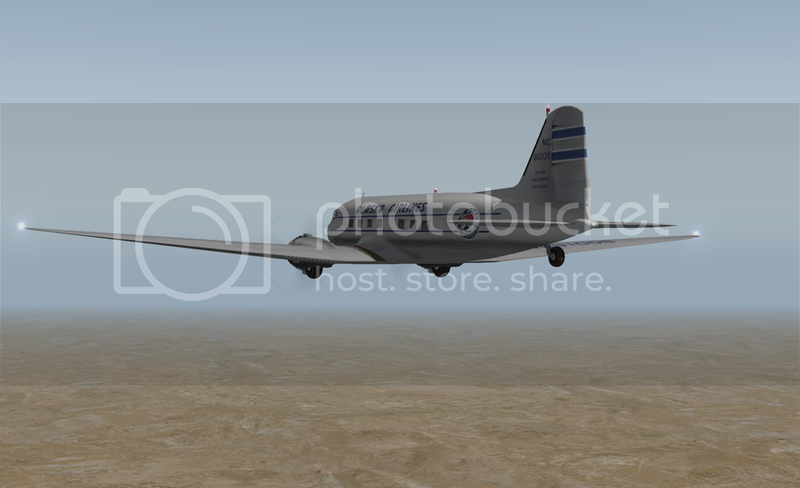 A flight to FB51 Motopi just for practice flying the newly purchased VSL DC-3 w a SimSmith (Rocky) livery. 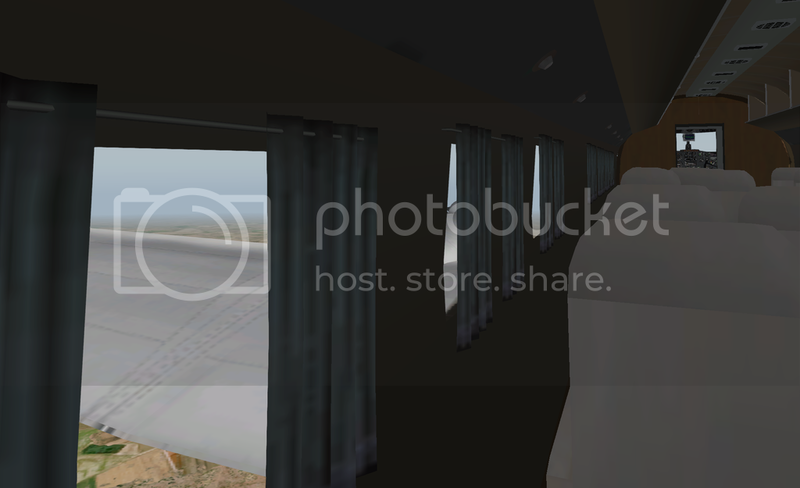 As you can see the runway is non-existent/featureless as I sit facing RWY 26 w only windsocks at both ends. Oh no... where's dat runway go? Adding runways is good news, hard to even see the windsocks unless you're right on top of them. It helps if you happen to spot some African Antelope, then you know you are close.